It's Friday, just a few days before the Inauguration and it's quiet in DC. Well, as quiet as the town gets. My guess is that the locals have fled and the visitors haven't shown up yet. But the visitors are coming -- I've heard they're expecting up to 5 million people are going to try to get down to the festivities on Tuesday. That means that if you got everyone in the entire state of Oregon, and then made a stop and picked up everyone in Idaho, you'd still be short a few hundred thousand bodies to make up the difference. This doesn't count all the people trying to call each other to figure out where they are in the crush of humanity. Tons of emergency calls are a given for the statistical certainty of injury or illness. 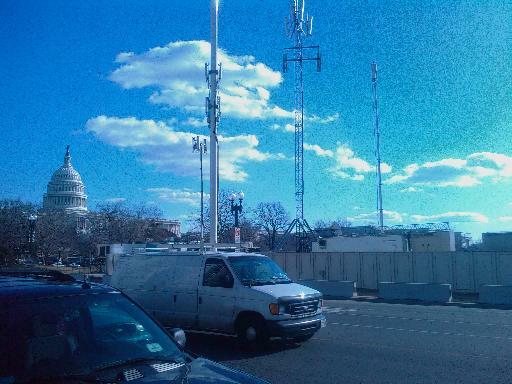 I don't know how they tie back into the rest of the network, whether they tapped into a trunk or if they have a satellited dish hidden behind the fence, but the fact that such a resource can be deployed on a temporary basis is pretty damn cool. Another note on Inaugural Infrastructure comes from the "Everybody poops" department. 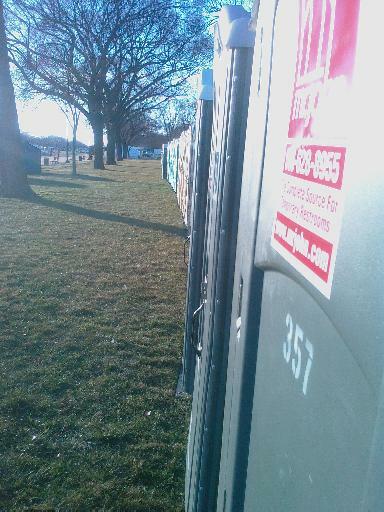 The Great Wall of Portapotties has been built from the Capitol for as far down the Mall as I could see. Photos don't do it justice, the sheer volume of plastic boxes is almost overwhelming. Sure, they're building huge scaffolding to hold up huge TVs, the news centers are being built, but the line up of crappers, that's how you know you live in a modern age. I wonder how they figure out what the ideal ratio of people to toilets would be. 5 million people, even if at a 100/1 ratio, would call for 50,000 porto-potties! yikes!